UltraEdit is a powerful text editor and code editor for Windows, Mac, and Linux that supports nearly any programming language and easily handles huge (4+ GB) files. Includes (S)FTP, SSH console, powerful find/replace with Perl regex support, scripting / macros, and more. The customer support is great, the functionality of the product is great, it does everything I need it to do, If you are working with text files in the GB size range UE is fast and powerful, it has a great search function, and plenty of built in tools to help you with whatever the task may be. I like everything! The customer support is great, the functionality of the product is great, it does everything I need it to do, If you are working with text files in the GB size range UE is fast and powerful, it has a great search function, and plenty of built in tools to help you with whatever the task may be. This is a rock solid product, that is well supported, you wont regret giving it a try. Moving, proofing, editing, searching, and reporting on large text files in excess of 4 GB! "Editor de código simple pero potente"
Este editor de código me sorprendió porque, aunque tiene muchas opciones, es muy ligero en cuanto a su funcionamiento, memoria RAM y consumo de CPU, las acciones se ejecutan rápidamente sin demora o retraso aparente, ya que son muy fluidas. Ultraedit tiene por defecto una variedad de temas para todos los gustos o necesidades, ya que incluye temas claros y oscuros. Personalmente, mi favorito es la luz para el día y la oscuridad para la noche, ya que permite un mayor descanso de mis ojos. Algunas de las características predeterminadas que llamo mi atención es la implementación nativa de un cliente FTP que está muy bien diseñado y que puede ayudar a deshacerse de programas FTP complicados si solo queremos descargar o cargar archivos de forma remota. La interfaz grafica de la aplicacion personalmente no me gusta demasiado ya que parece algo antigua y no presenta apenas colores por defecto, con los themes que se pueden instalar en la aplicacion mejora un poco pero el skin sigue siendo el mismo por lo que no mejora demasiado en el aspecto visual. Aunque la licencia puede ser algo más barata, recomiendo su compra, especialmente si usted es programador y necesita usar el editor todos los días, la versión de la licencia de pago tiene mejoras que la versión gratuita no tiene. Utilizo la aplicación para editar código HTML o CSS la mayoría del tiempo, pero a veces también PHP, Ultraedit ha funcionado muy bien y me ayuda a poder editar archivos rápidamente, cuando los archivos son muy grandes, la opción de búsqueda es especialmente útil. "Good editor for ASM and Java code"
I am an UltraEdit user with an active license for many years and I mainly use the application to edit text files or simple settings and also to program in ASM and Java. For ASM any editor is useful to me but in Java it is very useful for the auto completion that implements the application which is very accurate for the code suggestions. The application is one of the oldest and most powerful code editors that exist today although it is not updated too often, it is still very useful today to make changes to files. The application also supports different encoding types such as ANSI or UTF-8 so it is possible to use special characters from other languages such as Japanese or Chinese. It is also possible to open several files at the same time using the tabs, incidentally also supports different types of files including excels and .csv formats. The graphical interface is not bad but the themes included by default are somewhat outdated so the visual experience is not as pleasant as in other applications or similar code editors. UltraEdit is highly recommended to edit code and you can try it for free for 30 days by downloading the application on its website. I recommend that you change the theme by default to a darker one so that your view does not look resentful while you use the application. The graphical interface is not bad but the themes included by default are somewhat outdated so the visual experience is not as pleasant as in other applications or similar code editors. The keyboard shortcuts are somewhat different and some are a little complicated but it is possible to change them for those that adapt better to you. "UltraEdit helps me out with binary files"
As a frequent user of UltraEdit/UltraCompare i like the ease of modifying/editing binary files. While other texteditors can handle text very well, UltraEdit is the only solution for me with binary HEX files. Cut and Paste, Append, Seach for HEX values, and of course the Smart Binary compare in UltraEdit. Smooth operation between UltraEdit and Ultracompare is also a nice feature. The only thing that i don't like is the nag screen saying that there is an update available but NOT free for me (outside update period). I rather only see update screens that are available for me as a customer. Sometimes more features are not always desirable for me. I rather have rock solid basic features that allow me do my work than have tens of options that just work average. Just stay strong in the core functionality. Recommendation: Please don't send so many emails about update price offers. UltraEdit / UltraCompare is the robust solution handling any kind of file, including binary HEX files. Assembling firmware's for several of our devices, Comparing Flash readouts of corrupted/faulty controllers. "The Swiss knife to edit hundreds or thousands of text based files with a few clicks"
I used UltraEdit an long time to edit my WEB-sites because I was able to change content in hundreds of files at the same time. Also for all kinds programming languages I like the syntax highlighting and the syntax suggestions according to the current programming language. At first I used it to find and edit errors in huge text files of AutoCAD DXF (Drawing interchange format) Files. Also the program has a lot of possibilities to fit the user interface to your needs. It is really hard to find something what I don´t like because, if you think, the program should have this or that function a search in the help shows, that the program already has it. One big benefit is, that you get UltraCompare for no charge along with UltraEdit. You can also edit with it, but it is a very mighty tool to compare files with highlighting the differences. "Simple but powerful code editor"
This code editor surprised me because although it has many options it is very light in terms of its operation, ram memory and cpu consumption, the actions are executed quickly without delay or lag apparent as they are very fluid. Ultraedit has by default a variety of themes for all tastes or needs as it includes both light and dark themes, personally my favorite is the light for day and dark for night as it allows a greater rest of my eyes. Some default feature that I call my attention is the native implementation of an FTP client that is very well designed and that can help to get rid of complicated FTP programs if we only want to download or upload files remotely. Although the themes that are included natively have a good choice of colors can not say the same of the source used by the application because it shows a certain lack of aliasing at the source, at first I thought it could be my computer or monitor but changing to another source such as "Consoles" the problem is solved. Although the license may be somewhat cheaper, I recommend your purchase especially if you are a programmer and you need to use the editor every day, the version of the payment license has improvements that the free version does not have. I use the application to edit HTML or CSS code most of the time but sometimes also PHP, Ultraedit has worked very well and it helps me to be able to edit files quickly, when the files are very large the search option is especially useful . "Great alternative for advanced text editors"
It is a very advanced application that has a large number of options that make UltraEdit a highly customizable editor in all its aspects. It allows to open different files in the same application by means of a tab, which is very useful if we have a dual monitor configuration because we can have a tab on the screen and thus accelerate our efficiency. It is also very useful to search using regular expressions not only in the file that is currently open but in all the files of the directory that we decide. - Multi-platform support for Windows, Linux and MacOS, although I've only tried it on Windows and Linux, I think they work the same. - It has simple autocompletion, that is, it does not detect the programming language but it is based on the text already written in the document. - I am amazed how he handles large files without presenting any type of slowdown. Although it is possible to choose between different themes for the interface and the text, by default it is not very nice, especially in the theme of fonts that do not look good as if they did not have anti-aliasing applied so they look somewhat pixelated on their edges . Try to try several editors before deciding, for example ultraedit has several versions depending on whether you buy the license or not. I recommend you try the normal version first of all because this version already has everything necessary in my opinion. I was looking for an application that I could use in different operating systems because in the work I use Windows while at home I use Linux and I do not like the idea of using two different editors in each place, with UltraEdit I can use the same editor anywhere. In addition this editor is very complete and especially useful to search over text files by means of regular expressions. "So good after the years!!!" I use the regular expresion capabilities in Find and replace to change pieces of code to whatever I need. I also appreciate the ability to open and change huge files. I bought UE more than 10 years ago and I liked its simplicity. Yet it is a powerful editor that adapted pretty well to my day-to-day. During this years I have used it to code with different laguages, a couple of binary editions, but the most of the time I edit files using regular expressions. Its pretty handy to do it from your text editor instead having to write some code to perform the same job. The support rocks!!!! after more than 10 years they keep answering and solving the issues I found on the way after reinstalling the app after a HDD swap! Newer versions added many options and I enjoy the simplicity of older ones. I kept using 8.20. However In not really doing heavy coding, but simple day-to-day tasks. Go ahead! its a great app with superb support. Here the ability to be supported could be the difference, because there are developing environments that are free to use, but you will find no supoprt at all. Regular expressions in search and replace are a great tool for many day-to-day jobs. Its easy to get use to their syntax specially if you have used them somewhere else. I tend to use UE/UC mostly for file compares, as a hex editor, conversion tool, and a fast and light examiner for data and program files. It excels at all of those. The macros along with Find/Replace have saved so much time for me. Customer service is absolutely outstanding. Licensing or product support issues are all handled quickly and professionally. I've never felt it had good integration with compilers and debuggers to make it more of a complete IDE... I haven't looked into it for several iterations and it may have changed. Back in the olden days, when I used Brief and Emacs, they had pretty good integration that I never saw in UE, so never was able to really switch to it for all my programming needs. It's my go-to text utility and editor. Need to hack a binary? Examine a disk/flash card dump? Convert from one format to another? 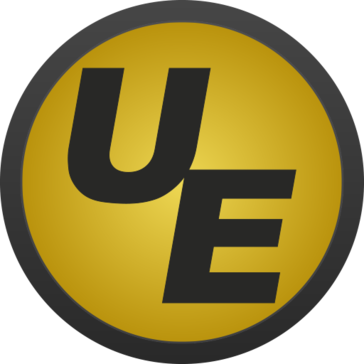 I don't use it for much programming, specifically, but I spend a lot of time using UE. "User for 20 years plus. Best text editor out there...every new job - first software I request"
The speed, ability to column edit, and it is compatible with so many things. If you are a CLI warrior at all, this is the text editor you have always dreamed of. If you have never column edited and column inserted dynamic text before you will be surprised how beneficial this software is. Parsing XML or HTML is a breeze with UltraEdit. opening up a 10GB file is like opening a 10KB file, no delay and instant access. Nothing, this text editor does it all...perfectly. It is a bit more expensive than what you typically might expect a text editor to be, but it is still worth every penny. If you time is valuable, you will make up the cost in no time,. Large HEX editing, fast sorting of huge corpus, data extraction and cleansing. "UltraEdit is a great file editor"
The feature I like best is column mode - it allows me to create or modify scripts with rows of similar data way faster than moving around by hand. I have never had it crash and it can handle fairly large files. UltraEdit makes me much more productive when coding shell script ETL and viewing data files than other tools like vi, pspad, or notepad++. Working with text data files is a breeze with UltraEdit. I am able to create sets of data using small extracts of other columns with ease. Creating quick scripts to do mass file name changes is easy with UltraEdit as well. The convenience of UltraCompare within ultra edit is a big time saver as well. I cannot find anything about UltraEdit that I dislike. As the updates have been released, it has simply grown faster, more robust and easier to use. UltraEdit has many more bells and whistles than I have ever used (or probably will use), but for those once in a while tasks (like looking at a file in hex), this tool seems to be able to do it all. I have been working with UltraEdit for several years and cannot imagine working without it. Try it, you will love it for editing text files! I use it to modify ETL scripts and configuration files. Features like column mode make it faster to create or update scripts compared to vi or pspad. The simplicity yet power of the editor. I can open gigabyte text files and work with them with ease but I'm able to set an interface that is simple and works well in a dark environment. Customer support has been exemplary. Updates have been consistent and regular. There is just not enough good to say about this. I use this on Windows and Mac OS. I use this to program, take notes, and code. The first thing that attracted me to this product was its tabbed text file viewing. There is nothing I do not like other than the Mac OS client really needs live spell check like Windows. I already put in a support request for this recently and they replied within a few minutes saying they will work on it. Worth every penny for a developer. Opening our company's massive hundreds of megs/gigabyte log files (text). But I use it for everything, taking notes, coding, getting rid of text formatting, etc... The tabbed view is a must so I can have tons of files opened at once. Asking me to say what I like best seems limiting, considering that there is so much to like. Among my favorites, though, are the amazingly fast full-text searching of files matching a mask across entire directory trees containing thousands of files, and the ability to use regular expressions in replacements almost exactly as I once did in Perl. The tight integration with UltraCompare, which is simply the best diff program ever, is also handy. I use both together to solve even the most complex source control merge conflicts. Throw in huge file support, spot-on syntax highlighting, ability to feed the active file into external programs or shell scripts, mass indenting and outdenting, brace matching, … you get the gist. It's not on everybody else's radar, e. g., Sublime Text gets regular mention, along with all the freebies like Notepad++. I wish that I saw UltraEdit on those lists from time to time. Take the All Access license, and don't look back. Since I design and write software for a living, the list of business problems that I solve with help from UltraEdit is endless, and includes interactive PHP programming, Python scripting, shell scripting (to tie programs together into special-purpose chains), all leading towards delivery of carefully tested applications for my paying clients. "Best Text Editor Available Anywhere"
I've been using UE for about 12-13 years. It's a well refined, feature rich and FAST editor. Code highlighting is one of my favorite features. You can easily create new Highlighting rules for languages that don't already have syntax profiles (wordfiles) available. I've used other free editors, they all feel crude and unrefined in comparison to UE. It's a great tool that I plan on using till retirement. There is very little to dislike with UE. But if I had to pick one thing, it would probably be XML support. While it's still very useable, I think more could be done to improve it's usability. Tech Support is top-notch. I've contacted IDM several times with questions, comments and suggestions. They have always been very quick to get back to me. They have even implemented one of my suggestions is a subsequent version. And they even let me know it was coming and let me try it out pre-release. Go figure. Great product, Great support.. What else can a person ask for !!! I use UE nearly every day for general data file viewing as well as viewing and editing code, everything from C++ to ABAP and MOCA. Code highlighting is awesome. "Best Text Editor for Hardcoder"
Shamefully, it's been bought in a few years. I'm a hardcoder web and php. I'm using Ultra Editor with UTF-8 character code. And of course, it's more than just a bunch of well-known editors, and it's more than just a few of them. Especially, it is very useful when you use Chinese, Korean, and Japanese. Ultra-editor may not be 100% complete. However, we haven't stopped updating a single time in years. However, it is modified immediately. Best of all, customer support is excellent. Make sure you use the Ultra Editor. There are so many functions. Believe it, try it, and request it when necessary. If you have a bug, report it and wait for an answer. It can be fixed immediately. Long-term corrections can sometimes be corrected even after one year. here are many times when I have to code more than a thousand lines once. Without Ultra Editors, there are many things that are impossible. Especially for Chinese, Japanese, and Korean editions called CJK. Ultra-Editor's powerful code-aware and converted capabilities shine. "An extremely powerful, customizable code/text editor"
* File handling is very strong, especially very large files, including fixed-format and CSV. * I wish they'd offer a range of themes (aka color schemes) for those of us who don't want a black screen. * There are *so many settings* that finding the setting you want can be daunting. Now that they've added the ability to search through Settings, it's a lot easier. But some special customizations still require you to directly edit the settings.ini file, which seems archaic in 2018. When you do the 30-day trial, be sure to look under the hood at the extensive functionality. Also, map the key-strokes to your liking for the major editor functions , so it's comfortable for you from the start. Install syntax highlighting add-ons for your favorite languages/file-types. I'm a professional programmer so a great code editor is required. But I have an IDE for most of my coding. I use UE mostly for viewing and editing large data files, editing HTML, scanning my source code (when UE's powerful Search features really rule). I also use it to create small code snippets, again for the power of Search/Replace. I like that I seldom need to contact them because their product is extremely intuitive, but when I do I get to a knowledgeable, pleasant representative without wading my way through an automated attendant. When I first started using the product I frequently spoke to the company founder, Ian Mead himself. One of the few products that I can find little fault with. Well worth the price! I have continued to upgrade since first using the product over 20 years ago. Can't say that for any other software I use. When configuring control systems, I frequently find it useful to manipulate .txt, .csv, .html, .xml .. and UE is my goto. I use it a lot to edit VBA, HTML, and other scripting languages and love the way that it formats accordingly. I have also used the HEX editor for troubleshooting and repair of damaged file headers, PLC programs, etc. UltraEdit is just a great software it help me to remove many tools I was using them to get the job done, now I can do everything like before and more in one place, and if you missed something you will find it in UEStudio for sure. Themes are fully customized which helped me to build my own interface with my customized colors specifically for my eyes if I need to work at night. Also the templates is very cool idea, I just customized my own templates, writing the code will be faster and easier than before. The price could look for some people expensive but comparing with the features and the advanced options it was perfect for me, at least 25 years of experience worth more than that. About the company they are very flexible and the support are so helpful if you need a solution the are ready to respond in no time, also I was need to change from product to another and they help me to do that with very short time and very easy process. really nothing, I do believe that nothing is complete 100%, this software had features more and more than what you could missed. You can just try it and you will see all the awesome features by yourself. "UltraEdit is without a doubt the best text editor on the market"
UltraEdit the most powerful text editor out there. The speed, flexibility, configuration options are wonderful. Perfect for handling large files that other editors would choke when trying to use. It is beyond just a programmer's / web developers editor. With it's UTF (Unicode) support I have used it to edit/review small files that came in other languages. I have used UltraEdit for some things that one would normally not think of a text editor for as UltraEdit was so powerful. I should also add the support with UltraEdit is amazing. They are fast to respond, and very friendly. They have send me ideas, suggestions and for the one bug they even sent ma a patch. I have seen the iffy support of other text editors. Getting good support from groups like IDM who makes UltraEdit is always a big benefit. The price to purchase UtlraEdit can be a little high. I only suggest buying it for people serious about their work and wanting "the best". If you are just starting out and/or don't know what a text editor is then this may not be for you. One problem is also a feature.... there are so many configuration options it can be tricky to know what you want. They have improved this with a config search option, but could improve the search more and give "examples". There are cheaper options, but if you are serious about your work and need from a long term perspective it is great. -Column Mode Support with column features. -XML Manager -- i did not even realize how nice this was till someone sent me a messed up XML File and i could use UltraEdit to find THEIR problems very quickly. "I "live" in UltraEdit-- have used it every day since 1995. " I have used UltraEdit since the beginning, v.1 in 1995. I am writing this review in UltraEdit. Mid-1990s I was using a Windows machine to edit webpages on a unix host. As Ian intended, the early UltraEdit was far better than NotePad and more comfortable than VI. It was also an all-purpose tool in Windows. It would open huge files of any type. I often used it to examine file headers for a clue to what the file was, and search for text strings to see what the file contained. I was using UltraEdit hours a day every day and growing the early World Wide Web to support my employer. While text-editing is more about fingers than the program, UltraEdit never got in my way. I earned many thanks for how quickly I could update webpages with UltraEdit. Improved grep and scripting became VERY valuable to me in maintaining web back-end scripts, text databases, and grooming URLs; also for authoring Perl and PHP code. I had a whole dynamic engine based on plain-text data files, "maintainable in NotePad" but most easily maintained in UltraEdit. This saved countless hours over hand-editing multiple files. Though I did much of this in "dumb editor" mode, UltraEdit soon sprouted code highlighting which made it easier to see my PHP screw-ups and keep track of brackets. Column Mode was often useful to re-order columnar data, plus it will do a Sum of a column making it handy for many minor math tasks. Macro saved many-many finger-strokes: if I could type a repetitive edit once, Macro would repeat the edit thousands of times in a snap. Show File In Browser got used a LOT when I was whacking HTML. Synchronized Scrolling is a great tool for comparing versions of a file. A snappy Word Count helps me know when I've typed too much. On the non-code side I was soon doing "ALL" my writing in UE. Even formal proposals to bosses: I put words down in UE's clean screen and massaged them into clarity before pasting into a word processor. Online text entry boxes such as in forums are too small and prone to crash; I'd write in UltraEdit and then paste into the web-box. UE's spell-check was a great help in days before browser spell-check. In this century, improved backup and deep clipboard have saved me from some of my fumbles. The FTP/SSH feature makes remote editing easier. I was using UE all the time, knew it was a "keeper", and wanted to support the developer. I bought the "lifetime" option; although the 3X price was steep on my puny pay, I felt it was a very good deal for me. I'm now using v.22 every day, and v.25 is a click away, so this worked out well. UltraEdit's customer relations have been very good to me. Whenever I needed a new key-code for a new version they responded quickly. I have never needed technical support-- each release is nearly bug-free. The one question I had, I quickly found information in their forum pointing to a minor update which fixed my glitch. The best tech support is a product that just works. Although I am now retired from paid HTML and PHP editing, I still use UltraEdit every day as my tool to put words on screen for forum postings and to document my retirement projects. There are lower-price editors, some still growing, others mature and quite good. After playing the field, there are several I could use. But I like Ian's business model. Charge about enough to keep good programmers working on the product steady. As a Programmer Editor, UE's customers do understand the value of programmer time. What's not to like? One teeny thing. As a long-time project focused on adding new functionality, the menus have gotten humongous. But the entire menu system is totally editable, so I "could" strip-down to more v.1 scale menus. I haven't done that so obviously it is no big deal. Try it. Works free for a month. I think it is worth every penny as a fully professional tool from a fully professional outfit. "The Ultimate Editor for All Seasons"
As a user of UltraEdit for nearly a quarter century, since it first appeared as a shareware, I've seen UltraEdit evolve into an all-encompassing, indispensable text and code editor. UltraEdit is fast and agile and handles large files (enormous CSVs and XMLs with thousands of nodes) without hiccups. As a text editor, UltraEdit helps you focus on writing--with advanced formatting features, syntax-based templates, FTP, and more. Multi-caret and column-based editing features save enormous amount of time when working with XML, CSV, and HTML files. UltraEdit's built-in macros are sufficient for many repetitive tasks, but its scripting engine is available for more advanced automation tasks. And its integrated FTP client and SSH/Telnet console add to UltraEdit's versatility. I have not found a single aspect of UltraEdit that I dislike. If you're looking for an advanced copy editor, UltraEdit does acrobatic tricks. If you're looking for an advanced coding tool with syntax highlighting, multi-caret editing, versioning, code-folding, snippet storage, syntax-based templates, macros, scripts, and more, UltraEdit brings it. UltraEdit saves me time. Repetitive tasks are automated. Syntax-based templates provide consistency and reduce typos and errors. The ability to organize and manage projects, deep integration with Windows, and countless additional features make UltraEdit my go-to tool when starting and ending the day. The only reason I was looking for a new editor was for one that had a column marker/view option. This is perfect for the column view. I like how you can create custom column view groups as I work with files that are block 8 and block 10. The only thing I wish the column view could do is that each file could be set to have their own column markers/view that is active. For example, one file has block 8 and another has block 10. The only way to do this that I know of is to open a new instance and set one instance block 8 markers and the other to block 10 markers. Great tool if you need column markers/view option. Saves a lot of time and typos from counting spaces when trying to edit block files. "UltraEdit is a very powerful programming editor"
It's a bit pricy for an editor. I suggest to strip some features down to lower the price. I use it only for C programming, so all the bells and whistles for Java, PHP, C#, etc... are not needed for me. It crashes once in a while with very large files when I am searching. I have not experienced this issue with the recently updated version 25.x.x. Menus are cluttered with unused commands for me, I would like to only see C language specific commands. UltraEdit is a personal investment for me. My company picked Notepad++ for us to use. UltraEdit es un software de edición de textos, privativo y comercial desarrollado por IDM Computer Solutions. Existe desde 1995 en el mercado, con lo cual tiene una expemrimentada carrera detrás. Es multiplataforma y funciona sobre Windows, Linux o Mac OS X en versiones para procesadores de 32 bits y 64 bits. - Incluye un cliente FTP para acceder a servidores FTP. - Herramientas de búsqueda de palabras y reemplazo. - Barra de herramienta exclusiva para edición de páginas HTML. - Gran seguridad al permitir el cifrado de archivos. - Editor hexadecimal para archivos en binario. - Resaltado de palabras clave mediante colores para los lenguajes C, C++, Visual Basic, HTML, Java, y Perl, que facilitan la lectura por diferentes miembros del equipo de desarrollo. - Permite trabajar con varios archivos a la vez mediante pestañas. - Incluye una caja en la barra de herramientas para buscar en internet mientras editamos. - No permite el trabajo en línea. - No es software libre. - El periodo de prueba son 15 días, después hay que adquirir la licencia. Es un editor muy completo. No tiene el encanto del sofware open source y además es de pago, pero la verdad que en el periodo de prueba lo que vemos nos esta gustando. Pruébenlo y decidan. Lo único que en la empresa hay que meditar es si realmente merece la pena comprar la licencia de este editor existiendo otras alternativas mucho menos completas como Notepad++. Aunque bien es cierto que si adquieres la licencia incluye un programa de soporte técnico y mantenimiento anual. "Wish i had found this software years ago"
being able to use all the suite apps from ultraedit, makes work flow so much faster. no more scrolling through folders then through files hunting for code segments. the support team is very responsive. the portable version let my license go with me even when my computer doesnt. the color coding scheme provides for quick spot checking of files. the page preview is imperfect, such as with many web builder softwares. I would like to see them have a temp file open in local browser instead. the code suggestion feature can get in the way at times. some characters auto populate the corresponding close character, where others do not. you eventually learn which ones do and dont. try it and you'll never go back to what you were using before - especially if you try the suite. the power is in the suite of products, not just the ultraedit software alone. and the suite subscription is a fantastic price. speed of repetitive edits throughout code has been a lifesaver. the ultrafinder tool has knocked days and weeks off projects when used with ultraedit. being able to load ultracompare from ultraedit has allowed much faster troubleshooting, and near-duplicate deployment of pages for multiple clients at once. "The don't call it UltraEdit for nothing - it is the last editor you'll ever need to buy." I've been using UltraEdit since 2001 and it's my favorite editor for just about any code - especially SQL, PL/SQL, JSON, and XML, among others. It can also handle just about any size file I throw at it, especially delimited flat files that sometimes range above 256MB. Its formatting abilities are hands-down the best I've found. Nothing! This tool has everything I need, including significant examples and helpful documentation. If you are going to use this everywhere, I'd consider licensing it for multiple machines. I tend to leave it around at some of my clients' sites and it can be a bit of a pain to discover that you forgot to de-install it. What I really love is the ability to change stuff across multiple columns of data with one toggle (Alt-C). I frequently have to edit SQL statements for better formatting and when I need to do it "old school" (there are GUIs that make it easy as well), I turn to my favorite editor. "UltraEdit continues to be the best!" Ease of access to all the original features, plus continued evolution of actually-useful more complex features. I am easily able to navigate parallel SQL files, locate, isolate and correct or easily merge code from one document to the other in any direction, and entirely via the keyboard (mouse is too slow!) Thank you Ultra-edit for excellent keyboard shortcut tools! Nothing really, except that the app and its companion UltraCompare are SO feature-rich these days that I'm sure I am under-utilising them. I guess I'm asking for easy access to tutorials for a user who is neither a rank beginner nor an expert - so that I can have a first-hand shot at trying out the many features I probably don't even know are there! "An UltraEdit user of over a decade (Since 2006)"
I like the versatility, the customisations that have been incorporated over the years, syntax highlighting (several languages and the ability to create your own), column mode (quick and saves me some scripting), setting up executable launching and getting terminal output right within the software. I also like the UltraCompare integration and the availability on multiple platforms (I use the software on Windows, macOS, Linux and also the portable app). The early days I disliked the cluttered UI, but this has gotten better. For the tasks that I undertake using the software I haven't found much to dislike to date. While there are many text editors/IDEs out there that are free, UE brings a lot of power and versatility into one place. I work with a lot of computational models that have text inputs and outputs only (no fancy GUIs) and UE helps with not only generating the input files and viewing the output files but also helps when I need to knock together a scripting tool. "Fast and Efficient Large text File Editor"
The speed with which Ultra Edit works with large text files - in particular the short time-to-open for very large text files and the efficient Find/Replace tools are most useful. I do not have enough experience with Ultra Edit yet to really be able to criticize specific features, so can't offer any useful opinions on which parts of it might be improved. Ultra Edit is a truly useful addition to your large file editing/querying toolbox and well worth the tiny price paid in terms of time saved and frustration avoided in using other, less suitable tools. My work involves the requirement to efficiently query and manipulate large (multi-gigabyte) text format log files and XML files and having a fast and responsive text editor that doesn't freeze or consume all of the host machines resources while attempting to perform search queries is a must. Ultra Edit fits this role perfectly. "Good for all applications and users"
Is a powerful ASCII editor that can be used in different applications, flexible and with powerful features. The ability to open many files at the same time, in different tabs, or the ability to search and replace in a series of files, either opened or listed, makes it a very useful tool. Integration with UltraCompare (either the free Lite versión or the Pro one) is very useful in terms of knowing differences among versions of same file. No features are disgusting. If I must say somenthing that dislike me is in the new versión, all commands have been moved due to new ribbon interface; this is just a consequence of Microsoft policy (change everything to disturb the users [joke]. Some of the features have never been used, thu, I cannot give opinión. These opinions are from the indicated company, in whoch I used the tool for many years. Powerful tool for a lot of ASCII related editing. Can replace many other editors like Notepad, Notepad++. Very good support both in knowledge and response time even out of the standard update loop.. I mostly used the tool for SGML and HTML editing. The use of several databases according to Military Specs (S2000M, MIL-STD-1388,...) is very easy to review for an experienced eye due to the capacity to open big files. After several years it also was used to help in text translations for software providers (menú and messages transtlations as they were stored in ASCII files). "Editor de texto muy versátil, potente y fácil de usar"
Es increíble la cantidad de funciones que tiene este software. Lo uso para editar rápidamente archivos de texto. Es rápido y tiene funciones con muchas opciones para ordenar, buscar (con expresiones regulares o expresiones propietarias) y formatos de texto (modo columna). Se puede usar para editar archivos de diferentes lenguajes de programación con resaltado automático de sintaxis. Casi todas las características se pueden personalizar al gusto de cada uno. Una maravilla. Lo único que no me gusta de UltraEdit es que la comparación de archivos no está integrada en el propio editor. La misma compañía tiene un software de comparación de archivos pero se vende por separado. La edición de archivos grandes lleva mucho tiempo, por lo que la pantalla permanece bloqueda durante mucho tiempo. Podrían mejorarlo con algún adorno visual indicando el porcentaje cargado. Si estás buscando un potente editor de texto, éste es el indicado. Puede ayudarte a modificar, buscar, reemplazar texto fácilmente y también puede usarse como editor de código (varios lenguajes de programación compatibles) con resaltado de sintaxis de código. Es muy personalizable. Admite diferentes formatos de archivo (UTF, ASCII, etc.) y tiene pestañas para cada archivo. Lo uso casi todos los días para editar archivos de texto sobre la marcha, para ordenar texto o para buscar y reemplazar texto. La funcionalidad de búsqueda y reemplazo es bastante potente y fácil de usar. Edito archivos de casi un giga de tamaño. Este es el único editor que pude encontrar que era asequible y fácil de usar y que podía manejar archivos muy grandes. "Own one of the top productivity go to products"
I've been in IT for over 40 years and I can say that the IDE family of products are some of the best tools on the market. I use UltraEdit several times daily and UltraCompare several times weekly. The ability to open large files quickly and robust built in search and replace functionality are my favorites. After spending several minutes thinking about this question, I honestly have no dislikes. I manage a programming staff and the all give it high marks. If you're looking for a low-cost, fully functional, feature-rich text editor, I've not found any better. UltraEdit quickly allows us to review log files, data files and miscellaneous files that have no default program associated. I can honestly say that productivity would suffer if we didn't have this tool. "Improves my efficiency and accuracy constructing and editing complex configuration files"
I use UE for constructing, editing and comparing complex router, switch and other network configurations. The ability to construct custom highlight rules, collapse sections and quickly navigate to a given area saves time and greatly improves my frustration coefficient. Importing log files into UE also allows me to use the complex filtering functions available. The program is stable, rarely, if ever, crashes or hangs. I'd like a better dark theme and sometimes my book marks mysteriously vanish. Locking my custom highlights takes a bit of work. But these are small issues. Make a list of specific tasks completed in the past using other tools. Then, download the free version and work on the same or similar tasks. After purchasing, set aside time to tweak the setup, themes and so on to your liking. Also, play with the syntax highlighting editor! If you're more visual - like me - the tool greatly improves efficiency. I can jump between configuration objects just by looking for a certain color. "Best and most comprehensive editor I have ever used!" I especially love the new feature that collapses all non-matching rows when in find mode. It is so much faster than hitting F3 over and over again to jump to the next match. This also makes it easier to lines with matches because they are all together. I've used UE for over ten years at home. The UI seemed much more compact and intuitive, especially in the toolbar. I needed to do a bit of hunting to locate some things like Hex mode. This will be the last, and only, editor you will ever need. Not only does it have features to view, search, and edit files, it has templates that make it ideal for use as a development UI for many languages and environments. If you don't use UE now, you are missing out. I mostly use UE to load huge multi GB files and search through them during data warehouse development. The features provided make formatting and searching the files very easy and fast. Once you use UltraEdit you'll never use Notepad again. This is the greatest text editor ever. My favorite function - understanding that I use a fraction of its power - is the ability to independently edit columns. I don't know any other program that will do that. I also like that the company tests its upgrades before releasing them - what a concept! Every software company should be as careful as the folks at UltraEdit. Nothing. This program is bulletproof - I have never had a problem with it. Get it now! This is a great program made by a great company. I use it to edit cranky HTML code, clean up messy Word files that have hidden code problems, sort data and, of course, edit columns. "by far one of the best and most simple IDE out there"
A lot more reliable than Atom, easier to use than PHP Storm or Sublime. it is definitely worth the money. I have tried almost all of the editors and IDEs out there and I keep coming back to UltraEdit and UltraStudio. Atom seems to just crash to often and is to slow. PHP Storm is OK, but leaves you wanting when working with other languages. UltraStudio is the perfect blend of performance, function and value. I really have nothing to say about a dislike of the product. This might be cliche, but there is very little room for improvement that I can think of. Maybe making things like connecting to your Code repositories a little more point and click. Try the different IDEs and Editors out there but be sure to put Ultraedit and ulatrStudio on your list. you will not be dissapointed. At NovoLogic, we focus on creating world class applications that help organizations realize their full potential from the leadership, their employees and the organization as a whole. Our platforms help organizations measure, assert, and shape their culture through talent selection, talent management and talent optimization. Without ultraEdit and ultraStudio, our job of doing this would be a whole lot harder. "UltraEdit saved me a lot of work"
A really mighty tool that I have been using for many years which never showed any limitations. During the usage of UltraEdit I never expierienced any problems. I am using Ultra Edit for working with different progamming languages and HTML but also to view the content of strange systems files. I had to change the website of my wife which meant to insert several lines of identical HTML Code in 166 files. I tried to do this with Adobe Dreamveaver but realized that it was not possible to insert several lines of code in one search and replace operation as the code had to be written with blanks an newlines. Of course, blanks and newlines are meanigless for the HTML code but you need it to structure your code. One single try with Ultra Edit did the job and I saved the horrible work to touch 166 files individually! This was really great help. "Excellent text editor for microcontroller code programming"
Language syntax is completely customizable so you can adapt any uncommon language to UE and get your syntax highlighted the way you like. Better editing experience and lots of functions that are not present in standard microcontroller IDEs. After you understand the interface and functions it's a shot. Differently than most users which probably use UltraEdit for web and software editing, I use it to write source code for microcontrollers in both assembly and C language. I found easier to write code in UE than the IDEs available from microcontroller manufacturers because UE have lots of funtions for code manipulation. In time to compile my program I simply call the compiler using the User tool feature which handles the compiler's command line and parameters i chose then my .hex file is generated at once and much faster than IDE. All output messages coming from the compiler falls to the output window so I can realize what errors and warnings are generated. A feature I like so much is that I can customize the language file to fit specific microcontroller model reserved words so I get all my code ever syntax highlighted the right way. I can add or delete new words at wish. I use too for some .ini file editing in custom programs. "Best text editor on the market!" I've used UltraEdit for 15+ years now for all my text (and binary in HEX format) needs. Converts between ASCII and Unicode, highlights syntax in a large number of languages, spell checks, multiple tabs / window controls, macro functions / custom integrations possible. It's SUPER feature rich and very FAST. I dislike that there are enough features that I haven't looked at them all yet. I feel like I am probably missing out on even more goodness. Try it! They have a trial version, if you use a lot of text file editing, this is for you. UltraEdit is like the Bugatti of text editors in a world awash with Fords and Chevys. It does everything well, and it does a lot of everything. There are developers that cram as many features as they can into their software and end up with half-baked (and buggy) results. UltraEdit is feature-rich, and all of it is well done. It doesn't have the community like other text/code editors such as Atom, Sublime, or even Eclipse. Convincing people to purchase UltraEdit is difficult due to the price and that alternatives are free or less expensive. There may be other more "popular" text / code editors, but UltraEdit is under appreciated in the software development world. You won't be dissapointed. I use it to write and edit code, and also to manipulate text and xml files. UltraEdit is so flexible that it can open just about any text-like file it feels like a Swiss Army tool. If I have to do serious editing or manipulating of code or text, I use UltraEdit. "Best all-around editing tool out there"
Probably the most-used feature is the Explorer context menu add-in. I love that I can right-click any file and open it in UE. I work with an abundance of odd data types (GIS and mining data) and many of which are plain-text. UE makes checking these files and working with them a breeze! Another great feature are the optional themes. I love being to customize software I use, and most is sorely lacking in this respect (or completely incapable). I can't think of a feature that I dislike and there are so many features that I haven't used, I doubt there will come a day when I will add anything to such a list. My recommendation to potential/new users would be to check out the help available and dig in and try out as many features as you can. Learning is mostly by trial and error, but UE makes this a relatively easy process. Plus, if you purchase a suite, you get other great tools for a great price. I use UE with most of my work processes and would probably spend quite a bit more time if I had to rely on some lesser tool. Modifying text files, finding and replacing text, column editing, syntax highlighting, and many other features are things that I use pretty much on a daily basis. "UltraEdit - Killer of Notepad"
Since I program in a few different languages, I like how I can highlight each project I am working on based on the language I am developing in. I have not found anything to dislike. The interface is great, the support is great. I tell people to try it all the time. Recently, there was an issue with a file that I was creating and sending to another department. To make a long story short, they were opening the file on a different OS and saving the file making it unreadable by the application. Using UltraEdit, I demonstrated to them that they were modifying the line endings of the file which was causing the problem. They had to see it to believe it. I've been using UE for twenty years or so, and I've been happy with it from the start. Bonus is that it is being further developed all the time and once in a while it introduces some new feature, that I did not even realize I missed. UE is easy to use tool with rich set of features. The only things that come to mind now are 1) the preferences/settings (sometimes it is hard to find a certain particular setting, which I know for a fact is somewhere there, but I do not remember where exactly), and 2) toolbar customization and settings export/import feature I am not totally happy with. Editors are a matter of taste. If you have not locked your choice, try it out. For me it is my primary coding editor - and editor in general. I especially like the column function plus almost all the built-in functions as I find a need for them that does not exist in other editors. I just ferl at home and comfortable with UltraEdit. I have used it for years and feel naked when it is not available on systems I have to use. I have tried a lot of editors out there, but keep coming back to UltraEdit. Sometimes an update breaks a function that I have gotten used to, and I have to learn how to perform the same type of function a new way, but this does not happen often. Give it a try across multiple platforms and see that production should increase because of it. Support is fantastic, usual response has been same or next day, and their solutions work. Just the ease of using this editor has saved me hours of frustration in performing numerous edits on programs and various texts is a comfort in itself. Just having a familiar interface is comfortable and time saving. Because of familiarity with this program, coding is performed much faster and basic text for letters and presentations is quicker. "I use this for scripts, programming, and many others"
I have used U-Edit for over 20 years. I have found it simple and versatile to use. Can do column editing among many other features I use. It's a fairly small light-weight program that does just about anything you need with regard to a text file - from programming to scripting to just plain editing. I like the added package ultra-compare when i make programming modifications and find I need to compare routines between various versions. Having used U-Edit for over 20 years, I have nothing I really dislike about it. I hate the new "ribbons" but IDM made the interface flexible and customizeable to some extent. I've used this software for over 20 years and have recommended it to various colleagues and companies in various fields with mixed responses to it from great to so-so use. This package has pretty much everything you need from programming to simple text/script editing. I love the various views you can use (eg. Classic mode or ribbon mode - for the newer users). best is column editing when you need to do stuff in a spreadsheet like manner like CSV files. Reasonably priced. Everything from programming to data management. From Fortran, to C++, to HTML and Python and just simple text editing for certain data input for certain models. We use this heavily in noise and other various modelling which require manual inputs or imported text files. "A Lifetime licence 10 times worth its price!" Sometimes it was difficult to adapt to the new layout that was provided: I don't have the time to search for the functionality I am used to use for ages in the new interface that's provided, even though it is more natural. My habits are really important. These guys answer questions more rapidly than we ask them and they really care about solving our difficulties. I love this mindset. I bought a lifetime license which was worth every penny invested. Do the same! We simply need to use a text editor to write programs in a multitude of languages: this was possible with UltraEdit. "My Go To Editor of Choice"
File conversions (Unix/DOS, DOS/UNIX, MAC/DOS, etc), Base 64, etc. Ability to create custom macros to do the heavy lifting when editing large files. Ability to create custom scripts that put my name and other header information at the top of files. Find and replace across multiple open files. I have not found anything to dislike about UltraEdit. If you are looking for an editor that can connect to Linux, UNIX, as well as edit files on Windows systems then UltraEdit is for you. I do web developing and also system administration. UltraEdit makes it a breeze to write web code or BASH, KORN, scripts on remote Linux, UNIX servers via SFTP/FTP. I use the Windows, MAC, and Linux versions of UltraEdit depending on what I am working on. On Windows it has the ability to create custom macros to modify large text files and I can use Smart Templates to quickly insert code into a file that I am working on. Another UltraEdit feature that I like is the ability to edit a column of data and insert a sequentially numbered column at the click of a button. There are too many awesome features to list. I've been using IDM products for years. Not only are the products great but the customer service is excellent too. They always answer my questions, take my occasional bug report seriously, and are just nice people. The ability to customize context highlighting is great and has allowed me to create some really useful tools. When people tell me how good their text editor is (Notepad++, etc) I always tell them that UE is better and does more. I can find very little to complain about with IDM. I've had complaints in the past, told them, and they fixed them! It is the best text editor out there. There is so much that it will do. Compare it against your favorite text editor, UE is probably better. Better than anything I've used. Too numerous to list - everything from logging work done on projects to keeping outlines of books I am working on. UltraCompare is indispensable for comparing text files, Word docs, Excel docs, etc. The syntax highlighting is superb. I quickly and painlessly set UltraEdit up to easily distinguish my arguments, local, module & global variables and subroutines exactly the way I want to. The ability to match a paren and select the that block of code is extremely helpful and saves untold amounts of frustration. I could go on describing all the great features I rely on but those are my top two features. I would like more than eight word groups for syntax highlighting (10? 12? dare I say it... unlimited?) To be fair eight word groups is plenty but if I had more, I would certainly use them. Definitely try it and take some time to dig in to what UltraEdit has to offer. The feature set and level of customizabilty is very deep. I believe every programmer/devloper can set up UltaEdit to suit their individual needs and that it will become an indispensible tool. I do a lot of programming in AutoLISP (an internal programming language for AutoCAD) Debugging AutoLisp programming is very painful and UltraEdit is an indispensible tool for me in making this easier. Using UltraEdit also significantly reduces the amount of commenting I need to add due to all the tools I have to clarify the intent and structure of my coding. UE is great for all-around editing. I use it for Java, XML, HTML, SQL, random text files, and more. If I had to pick one feature as my favorite, it would be syntax highlighting & auto-indentation. Handling of very large files comes a close second. Tough question -- I can't really say I dislike anything. Only minor annoyance I can think of is this: when I open a large number of reports at one time, it can take a while. This is ok, but I would like to switch to something else while it's loading, however UE will come to the foreground as it loads each file, which results in me constantly switching back and forth, or just waiting till it's done. The number of features can be overwhelming. Take the time to go through it to see what's there. Little bit of everything: mining log files, creating batch scripts, application scripts and programs, etc. * We monitor all UltraEdit reviews to prevent fraudulent reviews and keep review quality high. We do not post reviews by company employees or direct competitors. Validated reviews require the user to submit a screenshot of the product containing their user ID, in order to verify a user is an actual user of the product. Hi there! Are you looking to implement a solution like UltraEdit?